The upcoming Knesset elections mark the culmination of settler dominance over the country's politics. During his first term in office in the late 1990s, Israeli Prime Minister Benjamin Netanyahu was considered the most polarizing leader the country had known. The left refused to forgive him for his part in the incitement that led to Yitzhak Rabin’s 1995 assassination, while the right adored him for leading the opposition to the Oslo Accords. Now approaching his fifth election campaign as head of the Likud party, Netanyahu doesn’t generate that much passion anymore. His fans are less enthusiastic, while his critics have grown tired. More than anything, it seems that a majority of Israelis have simply grown accustomed to him. At a time of regional upheaval and international instability, Netanyahu’s ability to maintain the status quo seems enough to deliver what, according to all indications, should be his third term in the prime minister’s office. 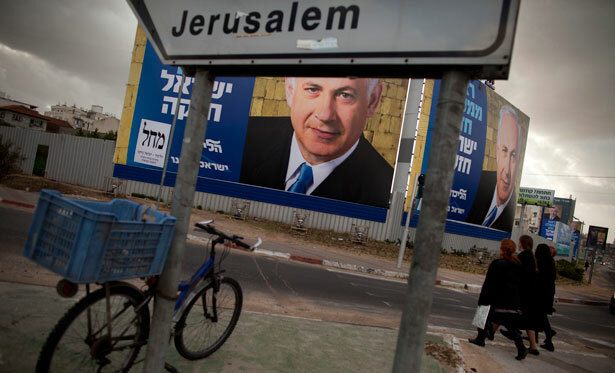 But Netanyahu’s success is not just about the relative stability Israelis are enjoying; it has even more to do with political and ideological changes that have seen the entire political system shift gradually to the right, including the rise of a new right-wing elite. Netanyahu’s Knesset bloc—comprising his own Likud party (which will run under a joint ticket with Avigdor Lieberman’s Yisrael Beiteinu party), the religious parties and the Orthodox—has been polling well above the sixty-seat threshold required to secure a coalition government. Furthermore, the Israeli center wasn’t able to unite under a single candidate, and the anti-Netanyahu vote will be divided among at least five different factions. The opposition cannot agree even on its own agenda: while Labor Party leader Shelly Yachimovich is campaigning on economic issues and enjoys the support of some of 2011’s social protest leaders, former Kadima leader Tzipi Livni has formed a new party (Hatnua, or the Movement) and is calling for a renewal of the diplomatic process with the Palestinian Authority; meanwhile, former TV anchorman Yair Lapid is winning some of the secular vote by promising benefits for the middle class and reform of the military draft. This fragmentation represents an existential crisis in a camp that has yet to come up with a coherent post-Oslo narrative that will appeal to a broad base of Israelis. Since there is a consensus within the political system that Netanyahu will be the next prime minister, some of his critics have already announced that they will try to join his new government “in order to influence it from within.” This shift to the right has further isolated the hard left, the non-Zionists and the Palestinian parties (Meretz, Hadash, Balad and other such lists), which could actually improve their position from the current Knesset but will have little influence over policy. Even so, these elections are far from the smooth sailing Netanyahu had hoped for, and a new challenge to the prime minister is emerging from, of all places, his base on the hard right. A couple of related events have taken place that are bound to influence Israeli politics in the years to come: the first occurred in November, when the settlers registered a major victory in the Likud primaries. In recent years, at least four organized groups from the West Bank or composed of settler supporters have enlisted new members in the Likud with the intention of influencing the party’s closed internal elections. As a result, practically all the hard-right candidates have been promoted to senior places on the party’s list for the coming elections, while the liberal flank has seen all of its members—including three ministers—pushed out of the Knesset. As the settlers were taking over the Likud, their rank and file were gathering behind a new leader: Naftali Bennett, a high-tech entrepreneur and former aide to Netanyahu who has become the head of the Jewish Home party. Bennett has managed to present a new, all-Israeli appeal to what had been an exclusive and old-fashioned veteran settler leadership. Some polls predict that he could double the current representation of the Jewish Home party at the expense of the Likud, while another, even more extreme right-wing faction is coming close to securing a couple of Knesset seats. As a result, with much of the Likud in their hands and enhanced representation on the Knesset’s hard right, the settlers are about to become the largest, most influential Knesset bloc and the dominant power in Israeli politics. Their ability to influence and, at times, control the national conversation became clear in the past few weeks, as more and more politicians produced hawkish statements distancing themselves from the two-state solution to the Palestinian conflict (in a recent Guardian interview, Bennett declared the conflict “insoluble” and said, “There is not going to be a Palestinian state within the tiny land of Israel”), while the government announced new construction projects in the occupied territories and even declared, after long deliberations, the first public university in a West Bank settlement. The rise of the hard right and the fragmentation of the left are not just isolated phenomena within the political system; they are the result of long-term demographic and social changes that have altered Israeli society in the past couple of decades. The Israel-born secular camp is shrinking, while the number of religious and ultra-Orthodox is on the rise. With immigrants from Russia supporting the right as well, the odds of a centrist candidate becoming prime minister are falling with every election. As a result, the settlers’ most important victories are taking place not on the ground in the West Bank, but within Israel’s institutions. A new elite is taking over the Israeli establishment, gradually pushing out the mostly Ashkenazi secular descendants of the old Labor Party. As visitors to any government office or convention will note, settlers and Jewish Home supporters are populating more and more positions in the Israeli bureaucracy, the media, the court system and the security establishment. At the same time, much of the secular upper middle class is gradually giving up its claim to power, concentrating its efforts on improving its own standard of living in the greater Tel Aviv area and in some smaller affluent communities north of the city. Recent years have seen the first settler appointed to the Supreme Court (which has been populated with conservative judges for some time now) and the first settler to own a mainstream media organization, the daily paper Maariv. Perhaps the most notable demonstration of power came in early 2011, when the settlers were able to veto one appointment for the new head of the General Security Service (Shin Bet) in favor of Yoram Cohen—the first religious Jew ever to head the GSS. Since his rise to power in the 1990s, Netanyahu has been under constant scrutiny from the security establishment (recent public criticism by former GSS heads being but the latest example), but in the future this problem is likely to diminish, if not completely disappear. The 2013 vote could therefore be seen as an important moment in Israeli history. Forty-five years after a few Jewish families settled in newly occupied Hebron, marking the birth of the settlement movement, what was a fringe group is now the driving force in Israeli politics, reshaping the national narrative and symbols in its own image. The elections this month are taking the form of an internal—and at times personal—battle within the right, with Netanyahu and Bennett presenting the two faces of “the new normal.” The process seems to have been completed: backed by an ad hoc coalition with the Orthodox and many of the million-plus Jewish immigrants from Russia, and with the support of the financial and political umbrella provided by the US Republican Party and the Jewish-American establishment, the religious-Zionist right has been able to take over the Jewish state. (Is it really surprising that Bennett has American roots, or that Netanyahu spent his formative years in the United States?) Whether this was an inevitable continuation of secular Zionism or the result of a series of mistakes in the decades following the 1967 war is for historians to debate. Ira Cherus recently raised “the question no one is asking”: “Are the US and Israel Heading For a Showdown?” (Dec. 20, originally at TomDispatch.com). Noam SheizafNoam Sheizaf, a Tel Aviv–based journalist, was the founding editor of +972 Magazine. He covers the Israeli political system and the conflict; his work has been published in Foreign Affairs, Foreign Policy, The Nation, Haaretz and other publications. Sheizaf grew up in Israel, served four and a half years in the IDF and later studied political science at Tel Aviv University.